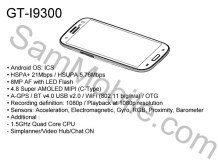 It's time for today's "photo of the Samsung Galaxy S3" leak - these seem to occur more and more often as we come closer to May 3, when Samsung's Unpacked event will finally settle things one and for all. The leaked photo in question (the one on the left) shows a device with a hardware home button with two capacitive keys on its sides (menu and back). You can see the volume rocker on the left and the power/lock key on the right - basically, the standard Samsung arrangement. Note: the middle and right photos come from previous leaks. The screen is off, so there's no way to tell if the device uses the on-screen buttons that we've seen in previous leaks. But it does look an awful lot like the sketch in the alleged leaked manual. 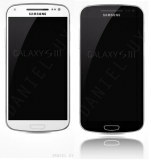 And the bezel is very thin - as it would need to be with the rumored 4.6-4.8" screen. ROFL you are aware that Samsung made the Galaxy Nexus right. hmm... Speak for yourself, Hardware issues mostly come because of USER related issues. Just a Galaxy Nexus with Samsung branding. FAKE.